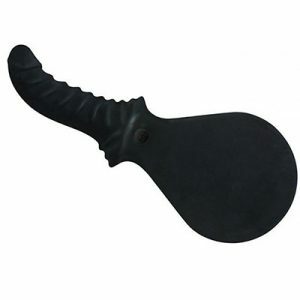 The Leather Flexi Paddle from Sax Leather is a beautifully crafted paddle to add to your collection of pleasure devices. Made from sturdy 4.5mm thick leather with a reinforced handle this is a must have piece. 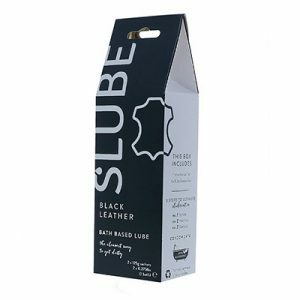 The flexible leather when used allows for a whipping action producing a strong thudding impact. The Leather Flexi Paddle from Sax Leather is a beautifully crafted paddle to add to your collection of pleasure devices. Made from sturdy 4.5mm thick leather with a reinforced handle this is a must have piece. The flexible leather when used allows for a whipping action producing a strong thudding impact. The paddle section itself is a full 18cm in diameter. This gives a strong large impact area ideal for spanking discipline. The simplicity of the Leather Flexi Paddle is just one of the elements that makes it so appealing. Made from two pieces of high-quality Australian leather stitched and crafted together, this piece is the ultimate in spanking tools. The leather feels just as delightful in your hand as it does on the willing skin of your partner. Made with a nice leather loop on the end for easy hanging storage, this hard-duty paddle is for those who want to push their limits and fantasies a little further. 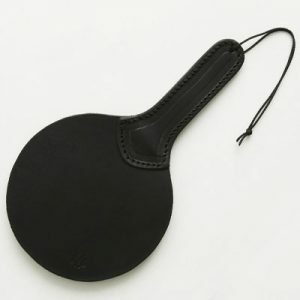 Look after the Leather Flexi Paddle as you would any leather product. To clean whip over with a damp cloth but do not run under water or submerge. Australian made from Australian Leather. Paddle section - 18cm in diameter.